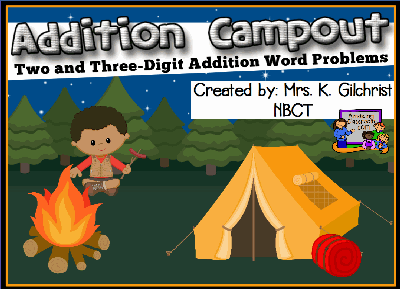 Your students will have fun learning all about multi-digit addition word problems with this fun, camping themed flipchart lesson. This lesson covers how to line up your numbers so you can add to find the sum, words that help us to know that we should add, and a 4 square graphic organizer to help us better understand and solve addition word problems. Enjoy!